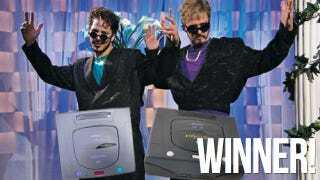 A couple Tokyo Game Show cosplayers devoted to the Sega Saturn provided the grist for this week's 'Shop Contest, which we're certain has already gotten a song stuck in your head. Step one, make her open the 'Shops. Step two, then you look at the 'Shops. We've got this week's best inside, plus overall winner Hypotenuse Man! Getting started is Orionsangel (9), who gets Minecraft out of the way with the first 'shop posted this week. There also were plenty of references to Daft Punk, like Assassin_Kensei (2), but also LooneyBinJim came in with an homage to Daft Bodies. Angryrider (1) and BigMike McCarthy (3) looked into those big gray boxes and saw Virtua Cop and Time Crisis, respectively. Snufkin (13) delivered several solid entries, and gets on the board with Wallace & Gromit. Regular finalist sciteach (12) has his take on Console Wars. And Howardc (5) speaks for me in his movie poster blurb for the RoboCop remake. Although what that has to do with a Sega Saturn, I do not know. My overall No. 1 goes to Hypotenuse Man. Simple premise and easy execution? Sure. Still funny. Thanks again to all who participated. There will be another contest tomorrow. You've been warned.